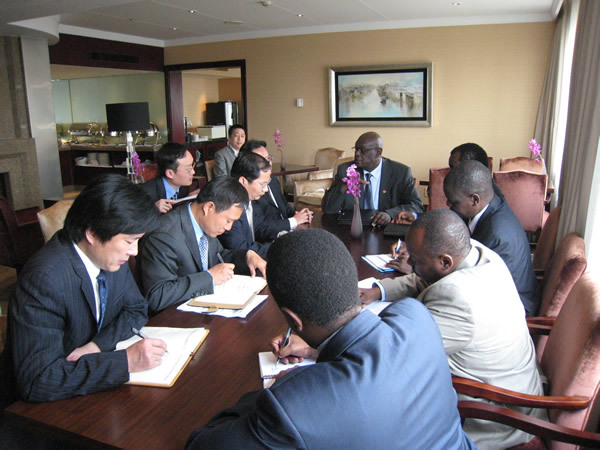 May 2nd, 2010 president Chen Gang attend the Minutes of meeting held on Sunday, at garden hotel - Shanghai, China Between the Government of Kenya and Consortium of Hydrochina international engineering corporation and Cheng Hsiung international corporation. Chairman of Minister of Regional Development Hon Fred Gumo, Ministry of Foreign Affairs Mr. J,M.Weru, president of Permanent Secretary Mr. Francis Kimemia, Ministry of Transportation Dr.Cyrus Njiru and other three members presenting the Government of Kenya. General Director of Cheng Hsiung International Corporation Mr. Gang Chen, Co-chairman of Hydrochina Mr.Panjilu, Vice president of Hydrochina Mr.Xu Chaozheng and other three members presenting the Consortium. This meeting was convened pursuant to the directive issued by H.E. The president of the Republic of Kenya for respective senior officials of the Government of Kenya and the Consortium in order to generate a mutually agreeable framework of cooperation for the speedy implementation of Bubisa Wind Power Project undertaken by the latter company in Kenya. A.Wind power feasibility and provision of equipments for wind measurements. B.Waiver of import duty and VAT on equipment. C.Provision of security and transport of equipment. D.Proposed visit to Kenya on 15th June, 2010.